Slots of fun and huge Progressive Jackpots! 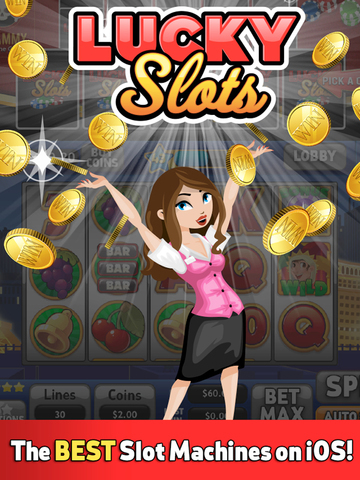 Play the luckiest Vegas casino slot machine game in the app store! Lucky Slots has the best machines, Bonus Games, Biggest Jackpots, and Free Coins every day! Now with millions of chips won every day on progressive jackpots! The top Facebook Slot Machine game is now available for mobile FREE on your iPad and iPad mini! Do you feel lucky? ► More FREE Coins given away Daily than anyone else! ► Win Huge Progressive Jackpots! ► Get the Biggest Bonuses and Jackpots of any Slot Machine! ► Play Classic Slots, Tumbling, or Progressive Jackpot Machines! 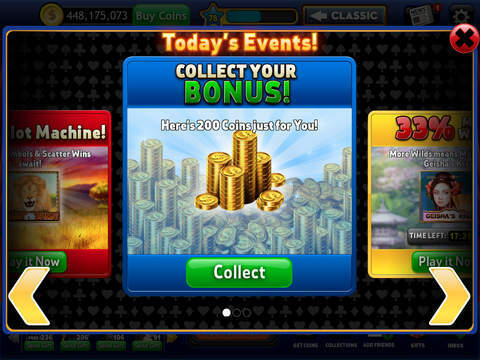 ► Unlock and Play the best Bonus Games and Mini-Games around! ► Try your luck on our Bonus Games! • Diamond Wins – compare to Wild Sapphires! • Spirit Canyon – compare to Buffalo Stampede! • Wild Cats – compare to Cats! • Joker’s Wild – our original and an old favorite! • Gold Rush – prospect for nuggets in this bonus game! • The Syndicate – inspired by Mafia Wars! • Candy Craze – compare to Candy Bars. Don’t get crushed! • Juicy Fruits – test your slot ninja skills! Don’t wait… Play Lucky Slots TODAY! – Introducing My Favorites! We remember your two most favorite slot machines for easy access on your home screen for easy access for your Lucky Slots quick fix! We hope you’re loving our app! If you have the time, we’d appreciate it if you left us a review! Your feedback is important to us.